The Alpha 10 package for your Nissan GT-R will leave you breathless. Speed unlike anything you can fathom. A true power package that will leave ANY supercar in its wake. 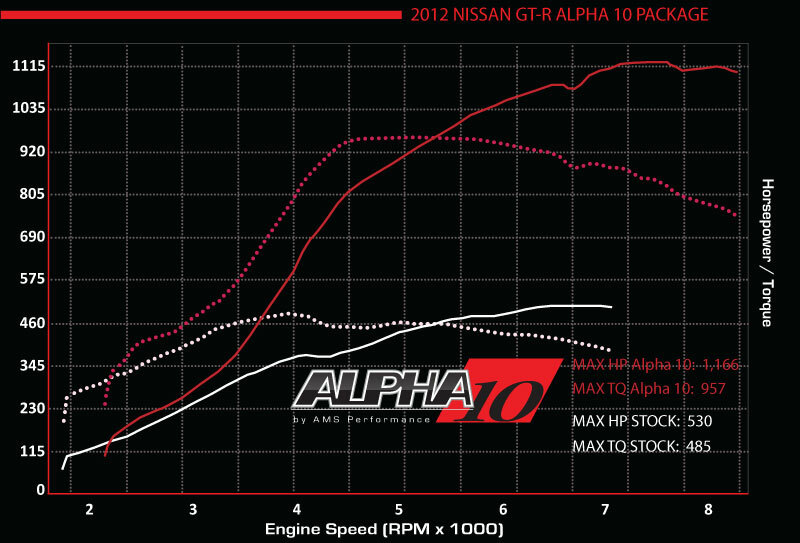 The Alpha 10 package for the GT-R combines stock-like drivability, with 1000+ hp on pump gas, or 1150+ hp on race gas. Typically, this kind of power comes at a cost of having to deal with drivability issues and narrow powerband. This simply is not the case with the Alpha 10 package, as you will be in control of a fine-tuned beast, capable of holding its own against some of the fastest cars at the strip, or while driving the store. In preliminary testing, Alpha shattered the world record for the quickest and fastest GT-R, running a [email protected] in the 1/4 mile with the full weight of a street car. The Alpha 3.8L race engine within the Alpha 10 GT-R is fortified with the best forged components available, and everything is balanced and blueprinted at AMS. With custom engine internals, a built transmission and the latest components for the drivetrain, you can have peace of mind while packing more than twice the horsepower of a stock GT-R.